Through his dogged pursuit of declassified government documents, VICE News reporter Jason Leopold has revealed that the CIA was directly involved in the production of Ben Affleck's Oscar-winning, propaganda fairy tale Argo. Argo, along with other productions like an episode of Bravo's Top Chef , the USA Network series Covert Affairs; and CIA-related documentaries on the History Channel and the BBC, "all received 'support' from the CIA's Office of Public Affairs (OPA), the division that interacts with journalists and acts as the liaison with the entertainment industry," writes Leopold, who received the documents in response to a Freedom of Information Act (FOIA) request. Additionally, and least surprisingly, the documents also confirm the agency's involvement in the making of Zero Dark Thirty, Kathryn Bigelow's pro-torture paean to the CIA. While it's still unclear to what extent the CIA was involved in the production of Argo, Leopold quotes CIA public affairs director Dean Boyd as saying that, beyond protecting classified material and national security secrets, the CIA's engagement with the entertainment industry seeks to guarantee a positive portrayal of American spies - or, as Boyd puts it, "an informed, balanced portrayal of the women and men of CIA." However, because of the lack of adequate records, we were unable to determine the extent of the CIA’s support to the eight projects, the extent to which foreign nationals participated in CIA-sponsored activities, and whether the Director/OPA approved the activities and participation of foreign nationals…. Failure on the part of CIA officers to adhere to the regulatory requirements could result in unauthorized disclosures, inappropriate actions and negative consequences for the CIA. The CIA's support for Argo, which was released in 2012 and went on to win three Academy Awards including Best Picture and Best Adapted Screenplay, is not shocking. The film - which purports to tells the "true story" of six American diplomats who escaped the takeover of the U.S. Embassy in Tehran on November 4, 1979, and hid out at the Canadian ambassador's house until finally leaving the country with the help of an American spy and a ludicrous cover story - is little more than a love letter to the CIA. Nearly every fact about what really happened was either glossed over or totally reimagined in order to present a Manichean tale of American heroism and ingenuity triumphing over Iranian savagery and buffoonery, all but omitting any historical context for the Iranian revolution and deliberately downplaying the vital role of ambassador Ken Taylor and the Canadian government in the whole affair. Indeed, even former President Jimmy Carter felt compelled to acknowledge that "90% of the contributions to the ideas and the consummation of the plan was Canadian [while] the movie gives almost full credit to the American CIA... Ben Affleck's character in the film was only in Tehran a day and a half and the real hero in my opinion was Ken Taylor, who was the Canadian ambassador who orchestrated the entire process." Taylor, who passed away last October, himself lamented in 2013 that Argo's Hollywood version of history demonized Iranians, playing into the long-maintained American narrative that Iran is merely "one long revolution and riot." "The movie maybe didn't give a chance that there's another side to Iranian society which is unfortunate — that is a more conventional side, a more hospitable side and an intent that they were looking for some degree of justice and hope and that it all wasn't just a violent demonstration for nothing," Taylor said, describing the embassy takeover in realistic terms. Summing up his own characterization of the film, Taylor added, "The amusing side is the script writer in Hollywood had no idea what he's talking about." This view, from someone who actually spent three years in Iran, is strikingly different than that of Ben Affleck, who directed Argo. In an interview with Rolling Stone, when Argo was first released, Affleck described the embassy takeover and hostage-taking as having "no rhyme or reason," while in a Huffington Post interview, he claimed that he "tried to make a movie that is absolutely just factual." But the fingerprints of the CIA were all over Argo and, despite their covert protocol, little was done to wipe them clean. 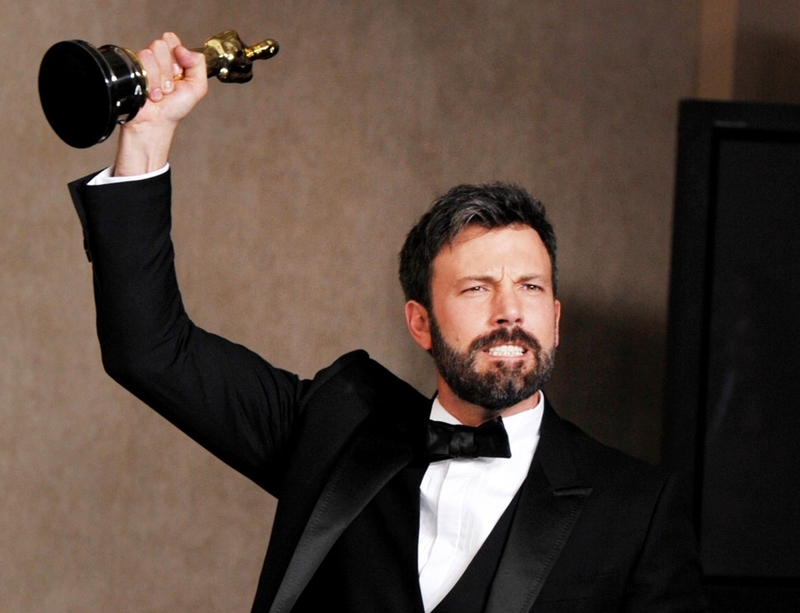 When he won the Best Director Golden Globe in February 2013, Ben Affleck praised the "clandestine service as well as the foreign service that is making sacrifices on behalf of the American people everyday [and] our troops serving over seas, I want to thank them very much," a statement echoed almost identically by co-producer Grant Heslov when the movie won Best Drama later that night. "I want to thank the folks from the clandestine services who don't always get the credit that they deserve, but they do a lot of great work. And thank you to them as well," said Heslov, who once co-starred as a CIA intel officer opposite Arnold Schwarzenegger in James Cameron's 1994 action blockbuster True Lies, which is widely regarded as one of the most Islamophobic and anti-Arab films ever made. That film "probably will stand the test of time as one of the most racist movies Hollywood has ever produced," said film scholar Jack Shaheen, author of Reel Bad Arabs, a study of Middle Eastern stereotyping in cinema. The following month, Argo screenwriter Chris Terrio won the Academy Award for Best Adapted Screenplay. In his acceptance speech, Terrio saved his most heartfelt gratitude for CIA agent Tony Mendez, the spy who - the story goes - concocted a clever ruse to help get the six Americans out of Iran. "I want to dedicate this to a man named Tony Mendez. 33 years ago, Tony, using nothing but his creativity and his intelligence, got six people out of a very bad situation," he said. As those close to the actual operation have already pointed out, Mendez was only in Tehran for a single day; he came, not alone, but with a partner; and he hardly did anything. Oh, and the "fake movie" he and his Hollywood buddies invented to fool unwitting Iranians? That cover story was never actually needed - it was never tested, as the actual departure of the diplomats from Tehran was fairly uneventful. "The truth is the immigration officers barely looked at us and we were processed out in the regular way," recalled one of the actual diplomats involved. "We got on the flight to Zurich and then we were taken to the US ambassador's residence in Berne. It was that straightforward." No angry mobs, no phony storyboards, no high-speed chase down the tarmac. Even Mendez himself noted the whole operation was "as smooth as silk." The only glitch? The flight departure time was delayed by an hour. Harrowing. When Argo won the Best Picture Oscar at the end of the night (and remotely presented with the award by non-other than First Lady Michelle Obama, beamed in live from the Diplomatic Room of the White House, while surrounded by U.S. military personnel), Ben Affleck took time not only to also thank Mendez, whom Affleck himself portrays in the film, but also "our friends in Iran, living in terrible circumstances right now." What? Even before that, however, the cat was out of the bag. Shortly after the movie's release, Terrio said during a Hollywood Reporter's Writers Roundtable discussion that, in researching the story, "I spent a bunch of time with Tony Mendez and also bunch of other CIA officers." Right before the movie came out, Affleck was interviewed on Fox News by Bill O'Reilly. The "serious aspect" of Argo, the director said, "was that this is really a tribute to the folks and our clandestine services and diplomats in the foreign service who are risking their lives over there... [and to] what they give up to serve us and to serve our country." Responding to O'Reilly description of Argo as "a Valentine from Ben Affleck to the Intelligence Community - the same people who water-boarded, the same people who renditioned," Affleck said, "I've been to the CIA. I met General David Petraeus. These are extraordinary honorable people at the CIA. Make no mistake about it." He then went on to say that he "wouldn't oppose military action" against Iran in the event that "they need to be whacked." "Our goal is an accurate portrayal of the men and women of the CIA, and the skill, innovation, daring, and commitment to public service that defines them. If you are part of the entertainment industry, and are working on a project that deals with the CIA, the Agency may be able to help you. We are in a position to give greater authenticity to scripts, stories, and other products in development." Far from proving "greater authenticity," however, with the CIA's help, the producers of Argo spun truth into mythology. The "based on a true story" patina gives cover to a deluge of lies, carefully crafted and amplified to show noble American spies and diplomats vanquishing the bumbling barbarians of revolutionary Iran. As Salon's Andrew O'Hehir so deftly put it, Argo's supposed "authenticity" is "all elaborate window dressing for a propaganda fable," a "patriotic fantasy" and a "totalizing fiction" that "turns a fascinating and complicated true story into a trite cavalcade of action-movie clichés and expository dialogue." It is no surprise then which film the U.S. government was rooting for on Oscar night. 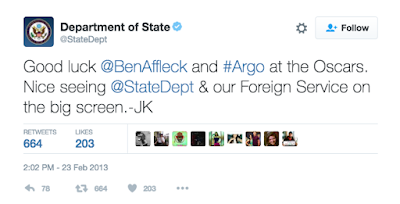 The day before the ceremony, a message from the State Department's official Twitter account, and attributed directly to Secretary of State John Kerry, declared: "Good luck @BenAffleck and #Argo at the Oscars. Nice seeing @StateDept & our Foreign Service on the big screen.-JK"
I've previously noted that the relationship between Hollywood and the military and intelligence arms of the U.S. government has long been cozy. "When the CIA or the Pentagon says, 'We'll help you, if you play ball with us,' that's favoring one form of speech over another. It becomes propaganda," David Robb, author of "Operation Hollywood: How the Pentagon Shapes and Censors the Movies," once told The Los Angeles Times. "The danger for filmmakers is that their product — entertainment and information — ends up being government spin." Now, thanks to Jason Leopold's FOIA request, we know just how true that really is. UPDATE: It's important to note that the love-fest between the filmmakers and the Central Intelligence Agency was not a one-way street. The CIA, in 2013, took to its Twitter account not only to playfully debunk some of Argo's wilder scenarios (separating the "reel" from the "real"), but also to heap praise on its own personnel - and Affleck himself. 10.12.12 - Argo's Asinine Auteur and his American Audience: Are We Hostages to Hollywood History? If I recall the only historically accurate part of the movie was the first 10 seconds where they briefly summarized US crimes. The rest was just Ocean's 11 soundtrack and strutting. Unfortunately, Luis, even that intro was full of mistakes; see here.